Guns are a big part of this escalation, says Fox, who is the Lipman Family Professor of Criminology, Law, and Public Policy at Northeastern University. He and his co-author, written with Emma Fridel, a PhD student in the School of Criminology and Criminal Justice, observe that even if purchased for self-defense purposes, all too often a gun in the home is used against a loved one. Sometimes this happens in the heat of an argument, other times deliberately to end a relationship "in a way that is speedier and less expensive than divorce," as the authors put it. "We really have to redouble our efforts in terms of preventing intimate partner homicide, especially in terms of guns," Fox says. "We need to focus more on federal gun legislation. We haven't had any substantial gun legislation at the federal level in 25 years, ever since the Brady Law." "The irony is that the beneficiaries were men," Fox says. "Women didn't feel as trapped as they once had been in a relationship, where at one point they saw the only way out was to pick up a loaded gun to shoot their loathed husband." Some states have extreme risk protection orders, commonly known as "red flag laws," which permit police or family members to petition a court to order the temporary removal of firearms from a person who may present a danger to themselves or others. 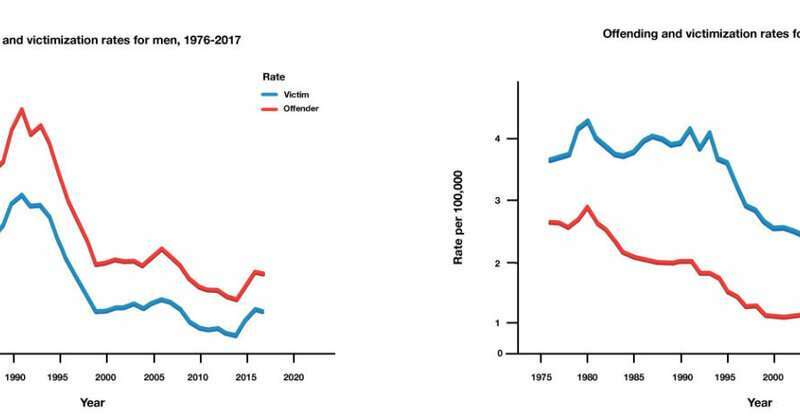 Though these laws have been enacted in the wake of mass shootings, there's little evidence of their effectiveness on lowering homicide rates, Fox says. "Even though I'm in favor of these red flag laws, there can be a situation where an attempt by a spouse, for example, or a family member to have someone's guns confiscated can precipitate violence by angering someone who already has a volatile temper," he says. When women kill, they're more likely to do it later in life (between the ages of 25-34), whereas nearly half of all male killers are younger than 25 years old, the study found. "You get a spike in homicide one or two years, and a lot of people start thinking that the sky is falling. You know, Chicken Little thinking," he says. 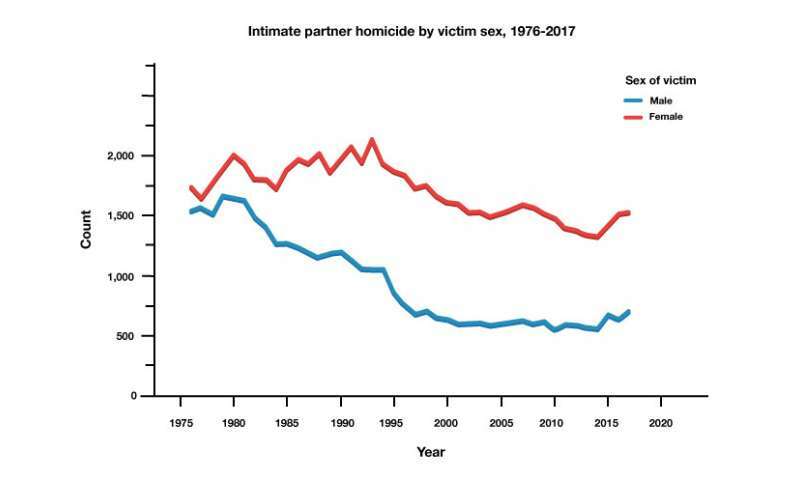 "Even though we've seen a few years of substantial increase in gun killings among intimate partners, it remains to be seen whether this persists or whether it's a short-term trend that will self-correct." He adds, "I'm hoping that it's the latter." Domestic violence is carried out by brutal people. Brutal people Always have a weapon handy, because Anything can be used as a weapon. 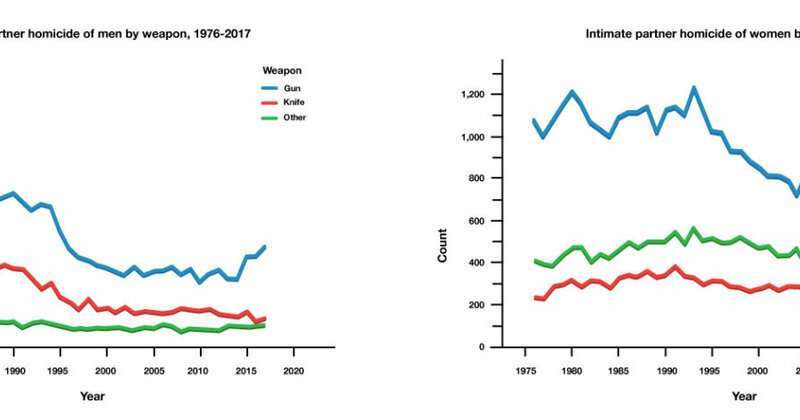 While unsecured guns are a serious problem in US society, because they are quickly at hand (and easily stolen), they are Not "the problem" in domestic violence. Although many see some sort of gun control as solving a lot of problems (which it may), it will Not solve or end domestic violence. Women, men and children will continue to be stabbed, beaten, pummeled and poisoned, simply because a brutal, violent person wants to do it. The very stable genius have the solution: Buy more guns! Remember the motto of the imbeciles: the only thing that stops a bad guy is a good guy with a gun. So buy guns for the wives, for the children, for the dog. In the world of the thoughful it is known that the only thing that stops acts of violence is spiritual liberation. Of course, you can not teach means of spiritual liberation to a old hog, he will be watching stormy being filthy and eating candies.